When we were kids, we knew what the future was going to be like. Every man, woman, and child was going to have a hoverboard. We were going to all have robot butlers to do all of our chores for us. We were all going to dress like David Bowie every day and our cars were going to be self-driving… and they were going to fly through the air! Speaking of flying through the air, weren’t we all supposed to have jetpacks too? Well, we did get those robot vacuum cleaners and some people have taken on a very audacious style sense these days! Many of those other future predictions didn’t quite come to fruition and we all had to learn the disappointing truth as we turned into adults. There were no jetpacks waiting for us, despite what we had been promised. Well, we want to keep that dream alive. 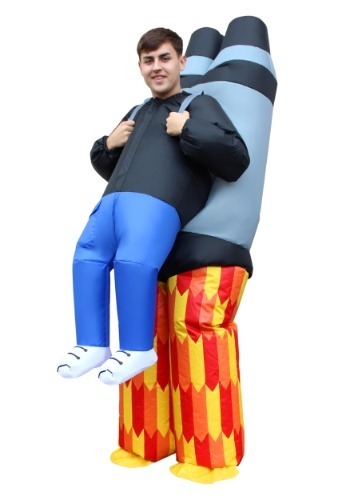 We think you should get that jetpack that you've always wanted, even if it is in the form of this wacky costume. This inflatable Jet Pack Pick Me Up costume is an adult outfit that makes you look like the owner of a snazzy new jetpack! The jumpsuit is designed to inflate with the included fan and motor. The back of the costume looks like a jetpack, while the pant legs are designed to look like streams of fire. The blue legs dangle down in front, which makes it appear like you’re really hovering in the air! Sure, it might not be a real one and you might not be able to fly through the air with this inflatable costume, but it will help you feel like you’re living in the future… at least until we get access to real jetpacks! Standard Recommended Heights 5'4" to 6'4" 5'4" to 6'4"